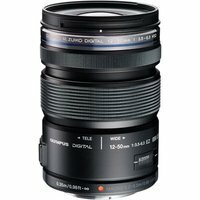 The Olympus 12-50mm f3.5-6.3 ZUIKO Digital ED lens is ideal for movies, portraits, high-quality macros and wide landscape shots. This versatile, compact lens comes with a new near silent MSC mechanism to ensure a swift start-up, faster operation and quiet autofocusing, making it perfect for budding movie makers and photographers. The use of an inner zooming system means that there is no variation in overall lens length during zooming, ensuring that stability can be maintained during hand-held shooting. The zooming speed can be switched in three steps according to the rotation angle of the zoom ring. Manual zooming is also available, allowing users to take full control. The lens is equipped with ED (extra-low dispersion) glass and aspherical lens elements to ensure superior sharpness and colour correction by minimising colour aberration.